That's the histogram of both black patches - same DL ink - Logicseek left - Netbit glossy right, the histrogram shows a delta luminance of 39 between these two patches, The Netbit black level has moved by just one vs. a dark reference print. That's within measurement tolerances, and I still can't see whether here on the black inks a GO overprint would even improve the performance. cheap cast coated paper. There are other valid reasons to use such paper -e.g. prints are not intended for longer term usage and storage or you don't care or you just want to use the cheapest paper available. And there is still the other question left - does a GO overprint - on dye inks in this case - any good to improve the fade resistance. You see a cropped scan of the cyan patches, the left/befoe and right/after windows of this histogram window at the top are identical since I don't change anything. The left field is the dark reference copy, the right field is split in half - the bottom half is covered with GO, the top part is not. The histogram shows two spikes - a spike at a luminance of 90 - of the dark copy and the protected field, not difference there - and another spike at 96 of the unproteced field, this is the result after 6 weeks - the cyan luminance raises by 6 during this time, that's about a level it is becoming visible easily. The GO protected field is as good as the dark copy - yes - a GO overprint further improves the fade performance of the DL inks. The magenta and yellow patches don't show a measurable sign of fading yet - within measuring tolerance at this time. I'm not looking into other protective measures like lamination or sprays, they probably give similar results but I don't like the additional handling of those methods. While your Fujifild DL inks performed very well, I am not too sure about 3rd party Canon inks, but I will also agree the going cheap on your paper choice can be even worse than using the lowest cheapest 3rd party inks. OEM dye ink and paper do work extremely well together, but if you can find a reasonable priced quality paper then 3rd party inks can give just as good fade resistance, but again not quite up to the standards and price of OEM products. 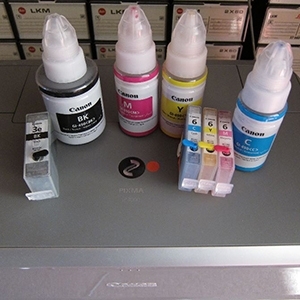 Printing with OEM Ink and Paper is not affordable to most, so the goal is to reach a good comprise, by using a combination of both 3rd party inks and quality papers, you can at least stay in the ball park with your print quality. This is a paradigm sea change comment, that one can get equivalent fade resistance with 3rd party inks, particularly concerning dye-based inks. Are you commenting on third party pigment or dye inks or both? Ops, @stratman is on my case, so I better clarify, what I meant was, its near enough but no cigar, clearly OEM has far better fade resistance than any 3rd party DYE ink could ever give you, but considering the huge cost differences, it’s just as good. Near enough but far better? Most guys using or intend using 3rd party dye inks, because of their low attractive price difference, imagine they can get the same or near the same fade resistance as OEM inks. Most guys... imagine they can get the same or near the same fade resistance as OEM inks. Ink stained Fingers and Flying Scotsman like this. I'm running another test at this time to see how much a gloss optimizer overprint on dye ink prints can reduce the fading, and I included one sheet with pigment inks w and w/o GO to compare whether and how much difference it makes. A GO overprint on pigment inks improves the look, the black level etc but this is not the main target for this test. I hope I'll have some first trend to report in a few days.